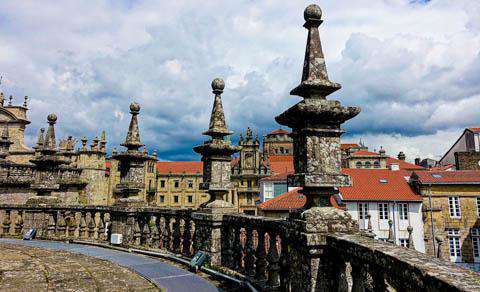 How much does it cost to travel to Santiago de Compostela? How much money will you need in Santiago de Compostela? €40 ($45) is the average daily price for traveling in Santiago de Compostela. The average price of food for one day is €9.43 ($11). The average price of a hotel for a couple is €41 ($46). Additional pricing is in the table below. These average travel prices have been collected from other travelers to help you plan your own travel budget. How expensive is Santiago de Compostela? How much money do I need for Santiago de Compostela? Santiago de Compostela is the capital city of northwest Spain's Galicia region. Its famous cathedral marks the culmination of the Way of Saint James pilgrimage route, and is the alleged burial site of the apostle himself. The pilgrimage route begins in the Pyrenees, 500 miles away, though travelers can decide to join the journey at certain points in between, depending on how far they want to walk and how much they want to see. The Old Town of the city is a UNESCO World Heritage Site with many narrow winding streets full of historic buildings. The cathedral is the city's treasure, an architectural wonder both inside and out. The Cathedral de Santiago de Compostela is, of course, the centerpiece of the city. Its baroque facade sculpted in Galician granite dates back to the 12th century and is laid out on a basilica plan. The towers of the cathedral exist just as grand with an interior decked with elaborate archways and columns to match. Each piece of art sculpted into the design of the cathedral tells a story, biblical tributes, that have drawn pilgrims to the site for centuries. The square in front of the cathedral, called the Praza do Obradoiro, is surrounded by more architectural gems. Though the cathedral is outstanding by far, there are other historic structures significant to the city, like the Pazo de Xelmirez with its vaulted medieval interior, the Hostal dos Reis Catolicos built by Ferdinand and Isabella, the medieval Colexio de San Xerome, and the Renaissance college Colexio de Fonseca. The surrounding area also has beautiful courtyards, and a famous ornate fountain of four horses with webbed feet called the Fuente de los Caballos. Old Town of Santiago de Compostela is the heart of the city. Named a UNESCO World Heritage Site, virtually all of the old town's streets are pedestrianized and many are cobbled. Most of the buildings are crafted of a grey-brown granite native to the area with terra cotta roof tiles, giving the streets a charm of a different time and place. With many shops, tapas bars, and bustling crowds, plus the grand cathedral with public squares and decorative architecture everywhere you go, it is sometimes hard to know where to look first. The squares and narrow streets of the Old Town contain Romanesque, Gothic, Renaissance, Baroque, and Neoclassicist buildings, and since the streets are fairly level it is very easy to see the city on foot. All in all, it is a very well-preserved historical city and one very rooted in faith. Beyond the endless opportunities for wandering old town streets and taking in grandiose architectural wonders, the city has a history that cannot be better told than by visiting some of the local museums. The Cathedral Museum, for example, shows the main Cathedral's history and artistic testimonies, from the first basilicas and archaeological remains to the present. Museum of the Galician People, housed in the former Convent of Santo Domingo de Bonaval, displays different aspects of costal life, traditional trades, the country, traditional costumes, and architecture. The Pilgrimage Museum also exhibits important history highlighting the significance, for European culture and Hispanic America, of the pilgrimage and worship of St. James. And as far as the art culture goes, Galician Centre of Contemporary Art has been holding a stable program in Old Town since 1995. The city also is home to various monasteries, being deeply rooted in religion. The outlying Santa Maria de Conxo Monastery is one such example important to Santiago de Compostela history. Other activities include guided tours, shopping, and dining. Like in many parts of Spain, tapas, raciones (literally "portions") and pinchos (tapas on bread) are staples in cuisine of Santiago de Compostela. These can be found on San Clemente and Carretas streets, as well as in the Ensanche area and in the outskirts of the city. Specialties of the Galician region, however, also include things like "Pulpo" or cooked octopus, seafood, many local cheeses, and cakes like the "Tarta de Santiago" (ground almond cake with powdered sugar). Churrasquería are also popular especially for meat enthusiasts, serving flame-grilled meats, T-bone steaks, chorizo sausage, and barbecued steaks. While Franco and Raíña streets, in the heart of the old quarter, are hubs for some of the best food around, dining houses, bars, taverns, and shellfish houses can be found in other areas as well like the San Pedro neighbourhood, Rúa Travesa street, or the Ensanche (new part of the city). The Old Town is, by far, the most popular hub for pilgrims and tourists, so expect a bustling atmosphere when it comes to meal times. Due to the famous pilgrimage route, the most popular way of getting to Santiago is by walking. The "Way of St. James" pilgrimage route is also more popularly known as the Camino de Santiago, which is a very long trek through northern Spain. The next most popular way of arriving or departing here is by bus. The bus station is located in the outskirts of the city, but you can get a public bus or a taxi to get to the city center. Long distance buses are provided by Arriva, Monbus, or Alsa. The train station is operated by RENFE and is located near the city center. The closest airport is Santiago de Compostela Airport, located about 20 minutes from the city center in the parish of Lavacolla. It is an international airport, the second busiest in Spain after Bilbao. Airlines include Aer Lingus, Air Europa, Easy Jet, Iberia, Ryanair, Swiss International, Turkish, and Vueling. The city itself can be easily navigated on foot.